This project aims to examine and explore the art nouveau movement (1890-1910) and link it to developments in design in the 21st century. Art Nouveau is considered a «total« art style which embraces, among others, architecture, fine and decorative arts, jewellery, interior design and lighting. 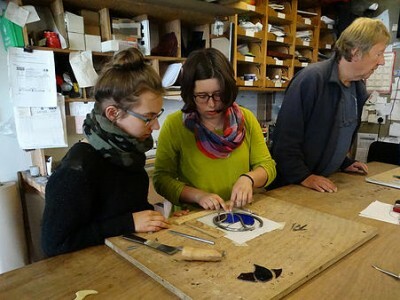 By studying the Art Nouveau movement, students will be encouraged to explore their own natural environment and create objects inspired by the natural world using 21st century materials and media. The project helps students to understand the place of the arts and creativity in today’s society and in the European context. The project will improve the attainment of young people in mathematics, science and literacy (mother tongue and foreign language), with a particularly emphasis on the development of entrepreneurship, digital skills and multilingualism. 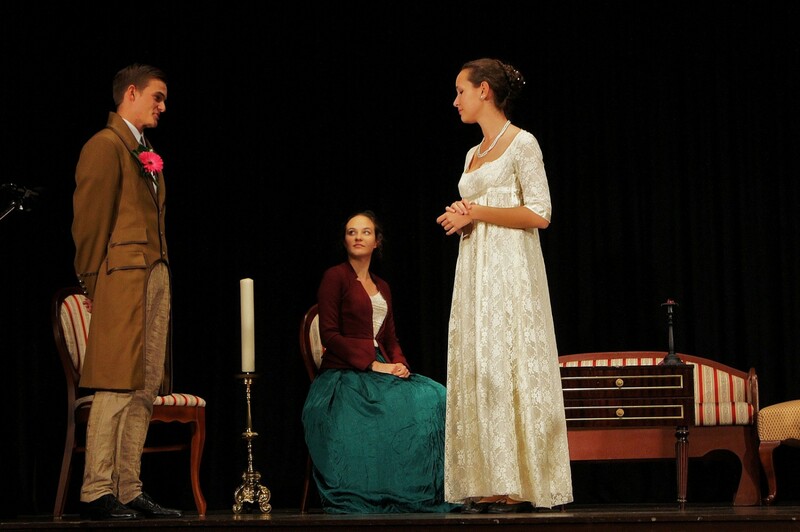 English Drama Club of St. Stanislav’s Institution presented a performance in English of a famous play by Oscar Wilde An Ideal Husband and published in 1895 at the onset of the Art Nouveau movement in Europe. The play was warmly received by the audience from all over Slovenia and on all three evenings in September 2015 the house was full. The first Erasmus mobility on the theme of Art Nouveau- Art Renouveau took place from 14th – 20th June 2015 in Wellington School from Ayr. More than 60 international pupils gathered on this occasion and were a part of an exciting and most inspiring programme. On the first day, the Erasmus group went on a visit trip to Glasgow, were they enjoyed a variety of activities such as a tour of the Glasgow School of Art and learnt lot about Sir Charles Rennie Mackintosh. There was also a walking tour of the city of Glasgow, looking especially at pieces of architecture in respect to Art Nouveau. On the following day students gathered at the host school for a whole day of creative workshops on photography and design. During the stay, they also visited the Isle of Arran by ferry, where they took a nature walk to discover the wildlife around it. The rest of the day consisted of workshops using stained glass and ceramic painting, which helped them to explore further the designs and shapes of Art Nouveau. The last day took place in Wellington school, where they organised an Art Nouveau – Art Renouveau exhibition of all the products created throughout the week. As a grand finale, we had a closing ceremony to review and celebrate the achievements of a successful week. 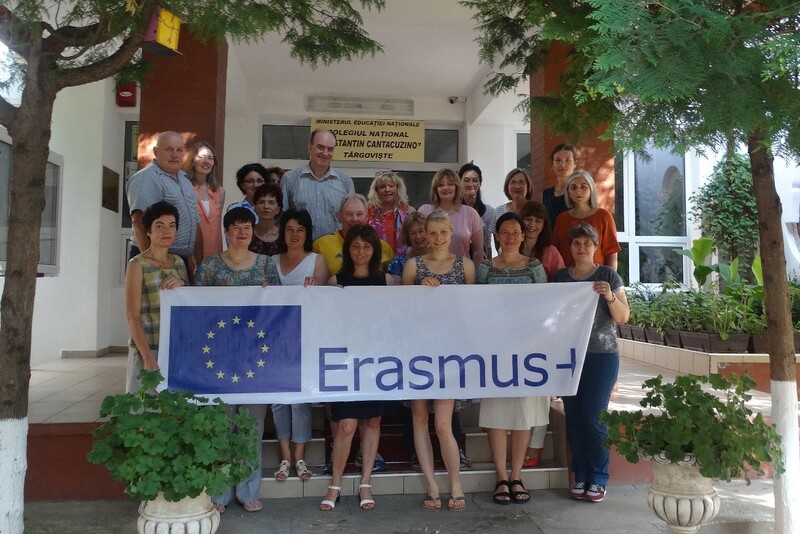 The second transnational project meeting of Art Art Nouveau – Art Renouveau took place from 1st – 5th July 2015 and was organized by Emilyan Stanev School from Veliko Tarnovo. The activities of the first year of the project were reviewed and evaluated: it was found out that all activities were carried out according to the plan made at the first TPM in Scotland. The response from all active participants was positive with a lot of ideas for further cooperation among partners and outer organizations. The results of the project are regularly published in local newspapers. Plans for the second year of the project were discussed since it will be a busy year with three Teaching Learning Activities on their way in the coming academic year (Rumania in September, Slovenia in January and Bulgaria in April). Alenka Battelino, Daša Oberč and Bernarda Podlipnik from St. Stanislav’s Institution participated in the event. The second TLA of Art Art Nouveau – Art Renouveau took place from 6th – 12th September 2015 and was organized by Colegiul National Constantine Cantacuzino in Târgovişte. The visit first included a tour of Targoviste, where participants learned all about Art Nouveau and paid specific attention to small architectural details, such as door handles and garden fences. What followed in the next days were a trip to Bucharest, where we visited the Romanian Parliament, which is the second largest administrative building in the world after Pentagon; a visit to the Romanian-orthodox Stavropoleos Monastery and learned about the Orthodox Church; a whole day trip to Sinaia, a mountainous region of Rumania with holiday resorts and castles, some of which are beautiful examples of Art Nouveau style. At workshops we did a lot of stitching, cards with Art Nouveau motifs made in a traditional way with corn, papier mache and ceramics with Art Nouveau motifs. Our stay in Rumania rounded up with the reception in the Town Mall by the mayor of Targoviste, while the afternoon was marked by the closing ceremony and the opening of the exhibition of the products that were made during the mobility. In the evening we had a wonderful farewell party observing traditional Rumanian dances. 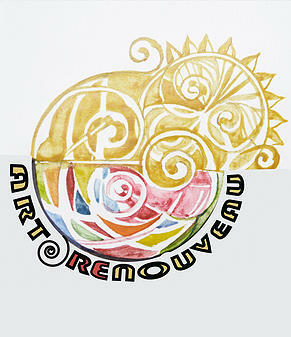 Teaching Learning Activity as a part of the project Art Nouveau – Art Renouveau, Erasmus +, will take place from 17th-23rd January 2016 in The Diocesan Classical Gymnasium. The purpose of the seven-day activities is to get to know the Art Nouveau movement in Slovenia and to create new ‘art renouveau’ works of art. Forty-seven students and teachers from Bulgaria, France, Germany, Rumania and Scotland will study, explore and have fun together with Slovenian participants and their families. The mentor of the project at St. Stanislav’s Institution is Alenka Battelino, teacher of English. Teaching Learning Activity as a part of the project Art Nouveau – Art Renouveau, Erasmus +, will take place from 11th-18th April, 2016 in Veliko Tarnovo in Bulgaria. The purpose of the seven-day activities is to learn about the Art Nouveau movement in Bulgaria and to create new ‘art renouveau’ works of art. Students and teachers from Bulgaria, France, Germany, Rumania, Slovenia and Scotland create pieces of art together and enjoy each other’s company. The mentor of the project at St. Stanislav’s Institution was Alenka Battelino, teacher of English. Art Nouveau-Art Renouveau: at the turn of the 19th and 20th Centuries a common artistic movement spread across Europe from the Atlantic Ocean to the Black Sea. Drawing on the philosophical and historical contexts of the Art Nouveau movement, participants learned about our shared European heritage and its local, national and international accents. Through developing an understanding of the beauty and function of design, students applied their knowledge to the creative process and made their own works of art. An emphasis on using recycled materials and the natural form reinforced the theory of sustainability in this project. The objectives of this project were to make young people aware of their joint European heritage and to foster a greater awareness of European citizenship. Emphasis was placed on the development of digital skills, linguistic competence, entrepreneurship and the creative process. The development of soft skills was important with young people learning how to live and work together in a multilingual and multinational environment. Six schools from six countries took part in this project: Bulgaria, France, Germany, Romania, Slovenia and the UK (Scotland). The group included a wide variety of educational establishments: public and private schools; schools with a religious affiliation and with none; schools for children from 3-18 and those with a narrower age range; day schools and some with boarding facilities; schools with pupils from a wide range of socio-economic backgrounds; schools with pupils with support needs; city schools and semi-rural schools. Art Nouveau was an important movement in these six countries and during the project, participants worked together and discovered common threads and local interpretations of the style. In particular, they learned of the interconnectivity of design and philosophy across Europe in the years leading up to the outbreak of WW1. The main activities fell into two groups: activities undertaken during the school year and those completed during TLAs. Each year, pupils studied elements of the Art Nouveau movement in their own area. They studied Art Nouveau through printed and web-based materials and visited areas of interest. When possible, pupils visited art exhibitions, e.g. the Klimt in Paris, the Mucha in Glasgow, The Nature of Art Nouveau (Narodni muzej Slovenije, International Travelling Exhibition, 20.1. – 19.4. 2015) in Ljubljana. These visits and discussions with experts formed an important part of the preparation for the Town Trails. In their own schools, participants undertook a number of creative workshops and produced works for sale at charity events and Christmas fairs. This gave pupils an insight into entrepreneurship and encouraged them to contribute to charities. Each TLA had a specific theme related to Art Nouveau-Art Renouveau. These are described fully in the relevant section of this report. In Scotland, the natural world was to the fore. In Germany, participants learned about Jugendstil architecture in the industrial context and in Ljubljana, the use of new materials and design in the reconstruction of the city after the 1905 earthquake were examined. In Bulgaria and Romania pupils learned that Art Nouveau arrived later. For most participants, a highlight of the project was the chance to work with experienced film producers in France. 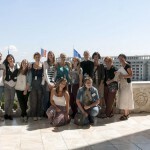 Students learned about film-making, and featured in a short documentary about the French Erasmus mobility. The results of this project are qualitative and quantitative. At the end of each TLA, students presented their work in a final exhibition and during the last TLA, a digital exhibition showed the results of three years’ work. Town Trails are available through local tourist offices and on the web for use by young visitors to the project countries. The project website provides a comprehensive picture of the work undertaken during TLAs and projects the student voice. The questionnaire confirms the positive impact of the project on pupils’ understanding of Art Nouveau.